A soft, white, lustrous transition metal (occupies a central block in the periodic table). It possesses the highest electrical conductivity, thermal conductivity and reflectivity of any metal. A common alloy of pure silver is sterling silver which is widely used in the jewellery industry and a favourite at The Jewellery Shop. Anyone can write about yellow gold but what about it's beautiful sister, Rosé Gold? Rosé is made in various ways however, typically it is comprised of either 50% yellow gold and 50% copper or alternatively, 4% silver is added to 75% gold and 21% copper to produce the pink colour we all love. Rhodium is one of the rarest and most expensive of the precious metals. 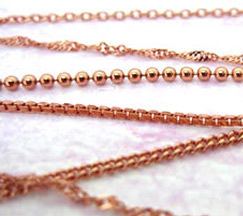 Corrosion resistant and tarnish proof it will protect gold and silver jewellery for years to come. View our large selection of sterling silver jewellery. 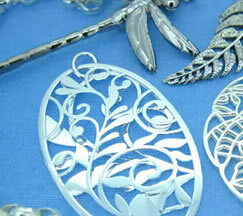 Sterling silver is the standard for beautiful high-quality silver jewellery. It's over 90% pure silver, mixed with alloys to add strength and durability. And it won't wear down, as silver plating can.